"Moist muffins with just the right combination of banana and chocolate chips. 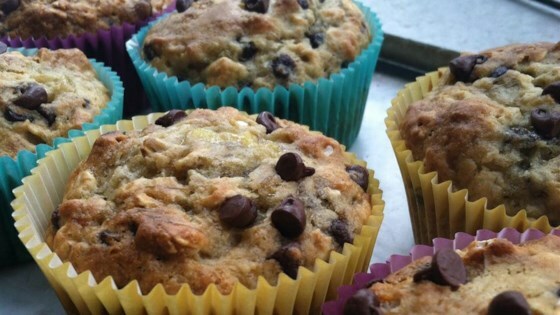 A healthy alternative to most banana chocolate chip muffins, this one uses oats and substitutes apple sauce instead of cooking oil!" I replaced the sugar with splenda and a little honey. I also replaced the chocolate chips with blueberries and coconut. Very moist and tasty. Will make again. Very tasty...added 1/4 cup flaxseed in place of 1/4 cup wheat flour. Healthy! I made this recipe, but accidentally used 1/2 cup of milk instead of 1/4 like the recipe called for. They turned out perfectly! They were moist and delicious! I made this per the recipe. I thought it was lacking something. Maybe salt? Maybe vanilla? Overall a good texture, but I just thought it was missing a little something.